Whether you’re treating a friend or yourself (hey, no judgment here), we have the answer for you – an E-Gift Card from Chipotle Mexican Grill. We are proof that food served fast doesn't have to be a typical “fast-food” experience. 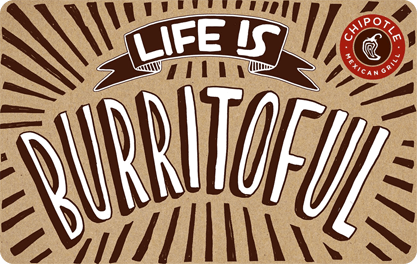 So no matter the occasion, Chipotle E-Gift Cards = instant happiness, joy, elation, and euphoria of the mouth. Leave the wrapping to us, you can thank us later.